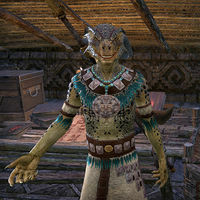 Jekka-Wass Vozei is an Argonian found at the Xinchei-Konu Monument. He is the current jekka-wass, the keeper responsible for watching over the ancient calendar. Unfortunately, the tablets that make up the calendar have recently been stolen and he is looking for someone to help retrieve and restore them. Tell me more about the calendar./I see. Tell me more about this calendar. "The Xinchei-Konu is not merely a calendar. It is a powerful ku-vastei; a catalyst of needed change. When seeds must grow, it gives us rain. When sprouts sink in mud, it brings the sun. As jekka-wass, it is my duty to watch over the monument." So the calendar can change the weather? "That is one of its purposes, yes. It would take a hundred tongues a hundred years to speak all of the Xinchei-Konu's secrets. It is one of the few remaining monuments from our Days of Stone-Nests." "The Days of Stone-Nests is one of the many terms used to describe the period of time when the Saxhleel created xanmeer, with the foolish notion that we could build that which time would not change. We have now learned better, of course." Why would the thief leave a book of riddles?/All right. Now, why would the thief leave a book of riddles? "To mock me, I'm sure. After all, I lack both the knowledge and means to seek out the tablets myself. The sooner you aid me in this, the better. I would rather suffer a thousand mire-gnats than the disapproving gaze of Nisswo Paraxeeh." "He who held the title of jekka-wass before me. Now he is a nisswo, a priest of Sithis. It was Paraxeeh who taught me all I know. I cannot let him know I failed him in such a way. I simply couldn't bear the shame." While there are still missing tablets, the following will be said by Jekka-Wass Vozei. "If you have the tablet, feel free to place it back into the Xinchei-Konu." Tell me about these tablets. "Each tablet represents a month in the year's cycle. Vakka, Xeech, Sisei, and so on. As with the dryskin calendar, there are twelve months in total. Without these tablets, the Xinchei-Konu is powerless." Can you tell me more about these seasons? "I will do you one better, actually. I have recently written a book on the subject, The Seasons of Argonia. It's right there on my desk. Feel free to have a look, and please, let me know if you have any notes." Once you have recovered and placed all the tablets, you can speak with Jekka-Wass Vozei again. He will thank you for finding them but then admit he needs more help for the next part. "What a sun-blessed hour this is! All of the tablets have been returned. Now, there is one more task before the Xinchei-Konu is fully restored. I must evoke the Vastei-Sei, otherwise known as the Ritual of Change." "Unfortunately, I am … unsure of the components needed to complete the ritual. Will you ask the aid of my mentor, Nisswo Paraxeeh? 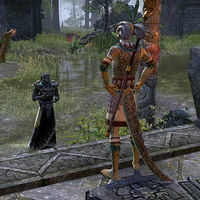 He watched over the monument before I was granted the honor, but now serves as a priest of Sithis." "Paraxeeh travels among the tribes, spreading the dark word. Last I heard, he was headed to the Bright-Throat Village. You'll most likely find him there. And please, do not mention the theft. I'd rather my mentor not learn of my incompetence." All right. I'll search for Nisswo Paraxeeh in the Bright-Throat Village. "I am once more indebted to you, beeko. Should Paraxeeh grow suspicious, tell him I wish to write about the ritual in my newest book. That should suffice." Why do you need to conduct this ritual? "The Xinchei-Konu is no mere collection of carved stone. It is the will of change, the force which pushes through stagnation. The Vastei-Sei will spark that power once more, connecting all back to one." Once you have found the ritual components and return, Vozei will be waiting for you at the Xinchei-Konu. "Welcome back. Dare I hope that Nisswo Paraxeeh agreed to help?" Yes, he told me to gather these ingredients. He also knew the tablets were stolen. "Ah. Well, I suppose word does travel. I will have to speak to him once the ritual is completed. But for now, I am afraid I must beg your help once more." I've combined the ritual components together. You must place the mixture into the ceremonial bowls as I say the incantation." I'll help you with the ritual. "It worked! The Xinchei-Konu changed the weather!" At this, he will walk into the center of the Xinchei-Konu to begin the ritual. Jekka-Wass Vozei "Vakka reelsh vastei buseek xal!" Jekka-Wass Vozei "Delaw ruheeva wuxa vastei bok tar-sakka!" When the second bowl is filled, green orbs will appear above the Xinchei-Konu and it will start to storm. Jekka-Wass Vozei "It worked! The Xinchei-Konu changed the weather!" After this success, Jekka-Wass Vozei can be spoken with. "The ritual worked! The Xinchei-Konu has regained its power once more." Yes, seems it all worked out. "And it's all thanks to you. You've helped me greatly throughout this entire ordeal. I hope you find this a suitable gift for all of your troubles! And feel free to visit the Xinchei-Konu whenever you please"
After you have completed the Ritual of Change, the localized storm will dissipate. Jekka-Wass Vozei "Huh? That's strange. I thought the effect would last much longer." Nisswo Paraxeeh will arrive with some … words for Vozei. Nisswo Paraxeeh "I see you were at least able to perform the Vastei-Sei successfully. Surprising, to say the least." Jekka-Wass Vozei "Why the cutting words, Paraxeeh? All I did, I did according to your teachings?" Nisswo Paraxeeh "Did I teach you to beg an ojel to perform your duties? You should have collected those tablets, Vozei! How could you not see that?" Jekka-Wass Vozei "Was … was it you who stole the tablets, Paraxeeh? Why? Why would you desecrate the Xinchei-Konu in such a way?" Nisswo Paraxeeh "If you had your eyes towards your people, and not only towards your books, I would have no need to take such actions. This was a lesson, Vozei. A lesson you failed." Jekka-Wass Vozei "But … but was able to perform the Vastei-Sei!" Nisswo Paraxeeh "Only for a moment. One of such weak will can never truly be a catalyst of change. Hmm. I suppose another lesson will now be in order." Nisso Paraxeeh will then walk off while Jekka-Wass Vozei gets an idea what he may do. Jekka-Wass Vozei "Paraxeeh? Wait! Don't tell me you're going to steal the tablets again!" He will then run after his mentor and disappear. Eventually he will return to the monument with a new outlook on things. "I have learned much through this ordeal. It is not enough to simply read the unmoving letters of books. I must also venture out into the world, and learn from the moving words that my people speak." 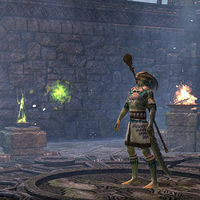 Though he claims to have written The Seasons of Argonia, the author of the book is Jekka-Wass Paxalt.